Do you use Sky Stones? Does anyone here use Sky Stones? If you don't know what they are, they're an ancient form of druidic divination for diving the answers to yes/no questions using pebbles/rocks/crystals. There are three small stones in which all three fit in your hand - a gold one, a silver one, and a black one. Some people substitute hematite for silver, tiger's eye or gold pyrite for gold and obsidian or onyx for the black stone. You ask a question, and with a casting cloth, toss them onto the cloth. Whichever lands closer to the black stone indicates whether your answer is a yes or a no. Silver is no, gold is yes. Some people cast them as the base of a tree, asking for its wisdom. Anyway, I've been using these for a while after I learned about them in Richard Webster's, "Oghams, Omens and Oracles: Divination In The Druidic Tradition"
Re: Do you use Sky Stones? Interesting.... as in Tarot, the book I am mainly trying to learn from, it says it is not useful for answering yes/no questions... I guess this is like using a pendulum or a coin... but I like the idea of three stones. You may find this interesting, Awen Stones by Wolf560. Personally I use the oracle Good Witch Bad Witch for yes/no question, along with using it as well for other readings. The deck is divided in good witches (yellow) and bad witches (red) and I come up with 3 cards spreads, if the majority of the cards is yellow, the answer is yes, if the majority is red, then it's no. And I use the 3 cards as answers to the matter at hand. In my coven, our HP gave us in a small pouch 6 stones, 3 black and 3 white, which could be used for yes/no question as well. Same principal, choose 3 stones and the max of color says if it's yes or no. I'm used to use Good Witch Bad Witch before joining the coven, so I've not used her gift but I've kept it because it was a gift and I find the set pretty. It turns out that one can use the Witch's Runes as well, the 13 runes set one by Susan Sheppard. 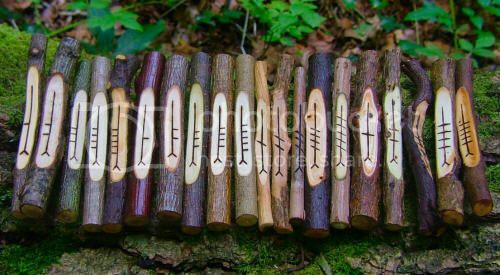 I've been reading the book and there is a section about Yes-No questions, it turns out some of the runes are positive and others negative, you select 3 runes and see which is the majority and you get your answers like that, majority of positive = yes and majority of negative = no, there are certain exceptions depending which runes appear though.